The opinions expressed by SYNCSUCKS.COM and those providing comments are theirs alone, and do not reflect the opinions of anyone else. SYNCSUCKS.COM is not responsible for the accuracy of any of the information supplied by the those commenting on this website. *Additional legal at page bottom. Over the last several months we have received more email than ever before. We truly wish we could respond to all of you. Visitors to SyncSucks.com have also more than doubled (which can't be good news for Ford vehicle owners). We will be posting new comments, issues and insights very soon! There’s been a LOT of news about the class-action suits being filed against Ford of late. Some of the articles attempt to classify the cases as frivolous lawsuits. While others dismiss the issues as non-safety-related and go on to imply that Ford Sync/MyFord Touch customers are a bunch of tech-challenged morons. It’s not about being able to sync the latest smart phone or decipher the highly complex system. (Let’s face it, it’s not a complicated system. Inconvenient, yes. Complex, no.) Instead, it is simply customers trying to get a defective product — one that is in 40% of all SYNC/MyFord Touch equipped vehicles — fixed! Well, it’s now August 2013 and surprise! My system still doesn't work! This website continues to get emails on a daily basis outlining how many 2013 Ford and Lincoln models still don't work. We recently received a six- page PDF outlining a ridiculous number of ongoing issues with a 2013 AWD Fusion Titanium that a customer purchased in April 2013. I'd have to ask these class-action critics what they'd do if they paid $1,300+ for a defective product that negatively affects so many aspects of their new vehicle? In many cases (including mine), the defective product had been taken in for repair (nine times and counting for me) and yet it still wasn’t properly repaired or replaced? Then essentially being given the middle finger by the manufacturer? Something else to ponder. Ford's VP and General Counsel David G. Leitch Ford Corporate Profile appears to have real issues with class- action lawsuits generally. He serves on the general counsel advisory committee for the Civil Justice Reform Group, an uber-secretive organization that funnels money to ATRA (American Tort Reform Association). This group seems hell bent on destroying individual’s rights when it comes to taking legal action against big businesses like Ford and their armies of attorneys. I think most people would be against a frivolous lawsuit of any kind, but it seems pretty clear that these groups are trying to do nothing but limit the big businesses’ responsibility and liability for their defective products. Thanks again for the great response — visitors to the site are growing every day! If we help only 1% of the thousands of monthly visitors, it’s well worth it! Wow, the response has been overwhelming. This site has received thousands of visitors each month and many of you have sent emails to share your own experience, seek advice or offer insight. If yours was one I was unable to respond to, I sincerely apologize. For all who have reached out, I wanted to provide you with an update on my case and also share a couple of thoughts. I hired a Los Angeles-based law firm to represent me with my claim against Ford. After more than 6 months, I had to force them into settling since their fees kept growing and the actual trial was still another 12-plus months away. I received $9,000 in the settlement, of that half went to the lawyers. I was disappointed, but it’s a small victory I suppose. Before you hire an attorney, you might consider filing a claim through the Better Business Bureau. Based on the emails I received, a few Sync-related claims have been settled in favor of the customer and against Ford. The general outcome is that Ford must take back the vehicle and refund all monies paid. Which is, of course, the outcome most customers are seeking. BBB and Ford partnership articles here and here. Bottom line: working with an attorney and/or joining the Class Action complaint may be your better options, but it’s certainly worth exploring all avenues. If any of you have feedback on the site or ideas on how it could be improved, please feel free to let me know. I have offered to include your experiences alongside mine, but am open to anything that will help others who've been subjected to Ford's faulty products and misdeeds. Through this site, I’ve heard complaints on virtually all Ford models that have Sync/ MyFordTouch, as well as several Lincoln models. If you would like us to include your story on the website, please take a few minutes to write it up as succinctly as possible and include all parts of the Sync system experience — back-up camera, phone, connection issues, playback issues, etc. Also let us know what personal info you think should be displayed (i.e. first name, nickname, no name, city/state). I think it would be nice for people to see complaints from all over the country, but it’s up to you. A couple of you have offered to work on or take over the website since my case has been settled. I have decided to retain control of the domain name, at least for now. I would, however, consider forwarding it to another site or server if somebody is interested in taking it on. I am also willing to share content or work together with any of you who might be interested. Again, I apologize for taking so long to update the site and hope your cases, claims or complaints are well on their way to being resolved in your favor. This process wouldn't be as bad if Ford offered some sort of support, but that just hasn't been the case. They do nothing but deny, sidestep, ignore and hope that you'll just go away and get tired of taking your vehicle back to the dealerships. All you can do is hang in there and keep fighting the good fight! From Reuters here thanks to The Center for Defensive Driving. From The Wall Street Journal here. In November 2010, I leased a 2011 Ford Edge. Not the vehicle I wanted, but since it would appear that Ford manipulates the residual value of its vehicles based on profit margin and inventory forecasts vs. vehicle lease-end value, I was left with few options. Add to that the fact that for the first time in my adult life, Ford failed to have new year F-150s available in November. I have been working with the same salesperson for almost as long as I have been a Ford customer. I wasn’t happy that not only was a truck unavailable but that my second choice, the Flex, wasn’t available either due to a much lower residual lease-end value. Because I’m the textbook example of a technophile, my salesperson consoled me and insisted I would absolutely LOVE all the high-tech features of Sync and MyFord Touch in the 2011 Edge. With the repeated hype and no other reasonable option, I agreed to lease the Edge. In all honesty, I only agreed to lease the Edge vs. a less expensive vehicle or other brand altogether because of the Sync/MyFord Touch system. Within the first two weeks, I had to take my 2011 Edge in due to a malfunctioning Sync system. Little did I know it would be the first of eight times I would have to take the vehicle in to service the very same Sync defects. Each time I took the vehicle in to Redlands Ford in Redlands, California. I asked for a loaner car and each time they responded with a NO. Eight days without my brand-new car, lost work and, with gas prices high, a reasonable amount spent on fuel driving back and forth to the dealer. That says nothing for the times a shuttle was unavailable and I had to arrange for somebody to drop off and pick me up. I have been told by Ford that these are not safety issues and therefore not subject to California lemon law. If any of you have been told the same, you will find that information to be absolutely false. It would seem that Ford Motor Company and Ford Motor Credit have cut corners to become what I would describe as VERY non customer-service- oriented. Over the years, I’ve had phone numbers and/or email addresses to contact Ford or Ford Motor Credit in the event of an issue. That has all changed now with phone numbers and email addresses regularly changing in order to keep customers from contacting a real person or person with any ability to actually help. In its place now is a computerized phone system that sends you into a frustrating and useless series of prompts that lead nowhere. Without an extension, you wind up being connected back to the first directory of “Press 1” etc. I have called Ford Motor Company Corporate on several occasions, asked for information and was told there is nothing they could do. When asked for info or somebody who could help, I was told there is nobody. After emailing Ford as directed on several occasions, I received emails that directed me to “keep working closely with my Ford dealer.”After “working closely with my Ford dealer,” the issues remain unresolved and the Sync/MyFord Touch system is still defective. When directed by my salesperson to contact the service manager and ask for an engineer to look at my vehicle, my calls were never returned. Now, after 12 months — yes, a full year — of trying to get somebody at Ford to help, I received a phone call from a Ford customer service agent wanting to discuss the Sync/MyFord Touch issues on my 2011 Ford Explorer. Really, my Explorer? I confirmed my name, address and the fact that I have never owned a Ford Explorer … and she continued. After 12 months of effort, I was completely blown away at how screwed up Ford customer service truly is. I was finally able to convince her that I had a 2011 Ford Edge. Obviously embarrassed, she said she would have somebody call me who handled customer service for the Ford Edge and Sync/MyFord Touch issues. Much to my surprise, a few days later I actually received a call from Mark. He confirmed my information and encouraged me to take my vehicle in for a ninth time for a more current update. 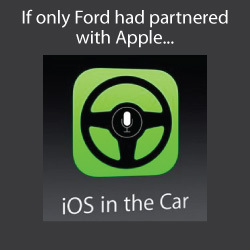 He also mentioned that Ford would be sending out an OS upgrade for the Sync/MyFord Touch in the first half of 2012. After a frustrating conversation explaining that I had already provided Ford ample opportunity to fix my car, he offered me compensation equal to one month’s lease payment. I told him he would need to do better after all they had put me through already. I suggested he take the car back as I could not afford to lose any additional income, wasted time, fuel costs, etc., much less continue to make payments on a defective and unsafe vehicle. He then advised me that I should take the offer as it was the best Ford would ever do. He also implied that if I took any Lemon Law or legal action that Ford would make my life miserable. Now, after 14 months I continue to make payments on a defective Ford vehicle. I am currently trying to decide if I want to just drop the vehicle off at the dealership, take the hit to my credit and sue or pursue legal action based on California Lemon Law. I will share my experiences here once I do decide. In the meantime, my hope is that this website will help the thousands of other Ford customers who are suffering with Ford Motor Company’s defective products and abusive customer service practices. I have forwarded a link for this website to various media outlets. I encourage others to do the same in hope of getting Ford to do right by its customers and effectively address its defective products. Life is too short to deal with a company that abuses its customers. Especially when it comes to a supposedly valued customer of 24+ years and a $36,000 product. Sadly, on my way home I noticed the screen brightness was lower by 30% or so. Checked the SYNC screen brightness control as well as the brightness control next to my headlight control and both were maxed at the highest setting. That is in addition to many of the same unresolved defects. Have to wonder whats next? I have engaged a law firm that is actively pursuing my case. I have been informed that Ford legal stated that I should go after Microsoft not Ford. Seems a little bizzare since I bought the vehicle from Ford Motor Company. Received my "jump drive" update from Ford and installed it 4 days ago. The simplified format is nice but my system is still glitchy. Head lamps oddly delayed and screen flicker sporadically. Have to wonder if this isn't an electrical defect with my 2011 Edge? Have said it was hardware all along but??? Back to the dealer. I was recently contatced by another defective Sync/ MyFordTouch Ford vehicle owner who filed a complaint with the BBB in Florida. They entered non-binding arbitration (very binding of Fords side). He was awarded a new vehicle! Ford must replace his defective vehicle with a new one that includes an updated compter system and software. As of 7/26/12 My Sync/MyFord Touch issues are ongoing (even with the most current update) and I need to take my Edge back in again. It’s just such a pain being without the vehicle for an entire day when it never gets fixed. I’d also suggest you keep taking your car back to the dealer as often as you can and keep all of the paperwork associated with your attempts to repair. I have discovered that dealerships do little more than Ford’s biding through misinformation (false) and try to blame us for the problems. It is still very important to show your repeated attempts to repair. Be extremely tenacious with Ford regarding your individual issues. Take videos of the issues if at all possible and keep a diary about how and when the issues occur. If you are on Facebook or other social media, I would keep posting SyncSucks.com along with your issues on all Ford and individual vehicle profiles. It seems to freak them out quite a bit even though they normally delete it fairly quickly. The website gets traffic as a result (from Ford corporate, too) and that in itself warns others and supports our struggle to get Ford to address their customers defective products. I have engaged an attorney and filed a lawsuit here in Los Angeles. I am demanding they take back my vehicle and reimburse me for all payments/money paid. The information contained in this website is for general information purposes only. The information is presented by SYNCSUCKS.COM and while we endeavour to keep the information up to date and correct, we make no representations or warranties of any kind, express or implied, about the completeness, accuracy, reliability, suitability or availability with respect to the website or the information, products, services, or related graphics contained on the website for any purpose. Any reliance you place on such information is therefore strictly at your own risk. Through this website you are able to link to other websites which are not under the control of SYNCSUCKS.COM. We have no control over the nature, content and availability of those sites. The inclusion of any links does not necessarily imply a recommendation or endorse the views expressed within them. Every effort is made to keep the website up and running smoothly. However, SYNCSUCKS.COM takes no responsibility for, and will not be liable for, the website being temporarily unavailable due to technical issues beyond our control. Copyright © 2014 SYNCSUCKS.com • All rights reserved. If you have or would like to post a comment, share your story or provide a link, please email by clicking here. Additional pages, including comments, will be added soon.